Mary Shelley borrows a quote from Paradise Lost, which appears as the epigraph to her 19th-century masterpiece Frankenstein: Or, The Modern Prometheus. In the quote, Adam’s question to God not only sets up Shelley’s story about an ambitious doctor and his pursuit for science, but also reflects the concerns of progress and technology brought by modernism at the time. Evidently, Shelley’s prose still echoes through history and the ethical criticisms of modernity conveyed through the tragic relationship of the creator and creature are ever more pertinent today. In the pre-post-humanist age, science, technology, art and philosophy begin to probe future possibilities that appear monstrous to us—the boundaries between the organic and inanimate, and thing and person are rapidly and readily materialized through technological means. The pre-post-humanist age is a world that is no longer our own, it is also inhabited by ‘uncanny entities’—alterities that emerged from the blurred boundaries of the human and the non-human. Uncanny entities are powerful agents with an ontological status that is visually imperceptible but is inferred through aesthetics by metaphor, metonymy, allure and representation. The study of ‘otherness’ is by no means anything novel; in the late 20th-century, post-modernist criticism addressed the inherent instabilities of meaning in the systems of knowledge, and exposed the otherwise oppressed identities from the institutionalized structures in society. However, similar to how post-colonial studies, feminist studies, queer studies and animal rights studies brought ‘otherness’ into view, the study of new ontologies and new materialisms in recent scholarship attempts to bring non-human entities to the theoretical foreground. This analysis of the uncanny entity stems from the interdisciplinary and theoretical intersections of philosophy, robotics, psychology, aesthetics and post-humanist art and explores the role of technology in society and, more specifically, how artists are exploring the ensuing themes of post-humanism. Recently, the hybridization of technology and art has brought forth challenging ethical and ontological questions concerning uncanny entities. Among them, hybrids, cyborgs, chimeras and transgenic art, are examples of visual explorations that stir us because they appear foreign to us. These uncanny entities appear ‘foreign’ because their visual representations oscillate between familiarity and uncanniness, in which a feeling of uncertainty challenges our traditional definitions of human, machine, and thing. This uncanny effect has been considered by manu artista as an important aesthetic tool of engagement that can aid us in reaching the post-humanist age by considering its ethical, ontological and aesthetic implications. While many artists have approached the divisive implications of post-humanism through artistic investigations that emphasize the anxiety of the intersection between technology and society, others have embraced the intertwining of both as a solution to overcoming the very frailty that defines the human being. 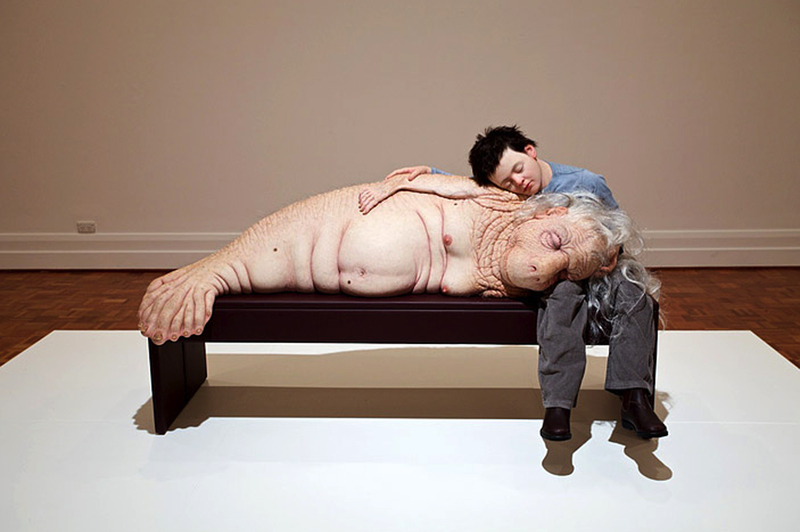 Take for instance the very different works of Patricia Piccinini and Stelarc. Patricia Piccinini is an artist who creates compelling works of chimera sculptures of animals and humans that examine the ethical implications of biotechnology. Using sculpture and digital media, her works oscillate between the natural and the artificial and present the uncanny in their anthropomorphic materializations. Piccinini echoes the concerns by authors such as Yoshihiro Francis Fukuyama, C.S. Lewis, and Shelley who criticized the technological and scientific instrumentalization of subjects. Visually, Piccinini’s chimeras are uncanny and elicit a feeling of dread, especially in their human-like skin, complete with folds, wrinkles and hair. Only after assessing their visual qualities, does the artist’s political stances to biotechnology come forth. Piccinini also enables a feeling of empathy to come forth from the anthropomorphic figures to the viewers. The feeling of empathy is the tool by which her figures become more than simply political artistic investigations, but more importantly, it is the crucial element by which the viewer is able to speculate about the chimera’s agency, the ethics of biotechnology that are otherwise not visually immediate. On the other hand, known for using prosthetics, robotics, biotechnology and virtual reality systems, Stelarc is an influential artist working within new media since the 1980s whose practices question both trans-humanist and post-humanist ideals. While trans-humanism is the goal of enhancing human intellectual, physical and psychological capacities, post-humanism is the critical theory that overcomes human primacy to acknowledge non-human entities. Stelarc’s notable works such as Third Hand (a prosthetic arm), Exoskeleton (a 6-legged walking robot), and Ear on Arm (an extra ear on his arm that transmits the sounds it hears) epitomize his thesis of the obsolete body, but also considers the body as an experimental site of alternative forms. To simply interpret his works as extending human-distinctive virtues is to dismiss the rich theoretical challenges and implications that he poses and that extend beyond the physical body. Through technology, artworks such as Stelarc’s undertake the deconstruction of the body as a vessel for consciousness, and instead take the body as a point of departure towards an emergence of Otherness. Stelarc’s works present the many forms of transgression to ‘the body’. Effectively, Stelarc has dislocated the physical body—in his aesthetic experimentations, the body appears uncanny—but more importantly, he has ruptured the concept of the body and dispersed the original human-virtues of embodiment and agency onto different technological platforms and consequently onto non-human things. As Brian Massumi suggests, Stelarc does not present the ideal transformations to the body in the 21st-century, but presents the body’s shared materiality with non-human things, and the subsequent challenges that this poses. The works by both Piccinini and Stelarc, while presenting aesthetically different ideas of the post-human future, have also encouraged speculation into alterities and their status among humans in the world. Piccinini’s works allow us to speculate on animal and human chimeras, their ethical status and the concerns with biotechnology. Stelarc proposes the obsoleteness of the body and further allows us to consider non-human and non-organic things and their agency and embodiment in their shared-materiality with humans as well as in the dispersal of the body onto other platforms. The question Adam poses to God, similar to when the creature questions Dr. Victor Frankenstein, stresses the decentering of the creator. Equally, the decentering of the human being from their ontological status occurs precisely when uncanny entities emerge from the peripheries of traditional definitions. As seen in the previous examples, contemporary artists challenge our position in the world and offer glimpses of potential ethical dimensions. The intersection of the studies of new ontology and new materialisms, and aesthetics suggests we also consider the extent to which technology and science perpetuate the humanistic ideals concealed within transhumanism. Accordingly, within the inevitability of a continued technological and scientific dominance in society, the role of aesthetic investigation is crucial in acquainting us with uncanny entities and allows us to question our roles as part of the world. John Milton, Paradise Lost: A Poem, in Twelve Books (Boston: Langdon Coffin, 1831), 241. Brian Massumi, ‘The Evolutionary Alchemy of Reason’, Stelarc: The Monograph, ed. Marquard Smith (Cambridge, Massachusetts: MIT Press, 2005), 173.